Transform any party into a red carpet event! 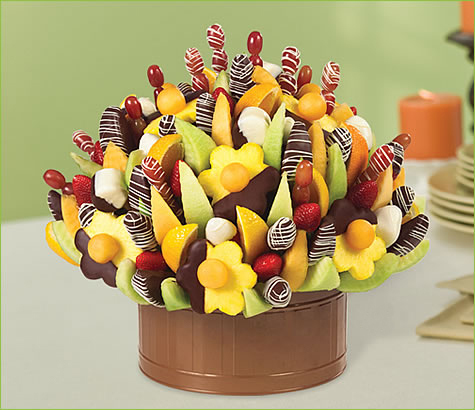 This delicious mix of refreshing fruit and rich chocolate is sure to impress your guests. The Impressive Party is overflowing with cantaloupe wedges, honeydew wedges, white chocolate dipped strawberries, chocolate dipped apples with a white glaze, dates with 4 different toppings: pistachio, coconut, almond, and white glaze, chocolate dipped pineapple daisies, orange wedges, bananas dipped in white and dark chocolate, grapes, and strawberries.